Typo are an Aussie gift, stationery and lifestyle brand and they have been around since way back in the day (aka 2009!) Typo has everything you could possibly want and things you never knew you had to have! Follow Typo to get news updates and products on your homepage. Typo is being followed by 0 people. Typo has 4 stores in the UK in our database. Typo is currently ranked 740 in the directory. Last month its rank was 757. Someone pinned the product Typo - Get Cushy Cushion - Donut 30 days ago. Someone pinned the product Typo - Mermaid Throw Blue - Blue 30 days ago. 2658 products added to Typo 30 days ago. 2658 products added to Typo 59 days ago. A Special Offer was added for Typo: Get 20% Off Your First Online Order ... 365 days ago. 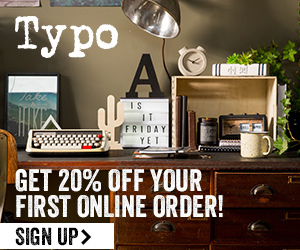 A Special Offer was added for Typo: Get 20% Off Your First Online Order When You Sign Up for Email at Typo UK 366 days ago. A Special Offer was added for Typo: Get 20% Off Your First Online Order When You Sign Up for Email at Typo UK! 366 days ago. 2658 products added to Typo 387 days ago. 156 products added to Typo 489 days ago.